Better late than never, here's a writeup from Day Two of last month's Project Tango Game Developer Event. Day Two kicked off with a short talk from nVidia about optimizing for the Tegra. Its incredible how much horsepower is in mobile devices nowadays. NVYVE was the next presentation, showing us a Project Tango app where you pilot a news chopper around a city, all controlled with the Tango. They showed off both on-screen controls (virtual thumbsticks) and controls using Project Tango's Motion Tracking abilities along with a multiplayer mode. After NVYVE was Left Field Labs, showing off their Tango projects: Animal Abduction and SoundScape. Both demos were very creative and fun. The crew at Left Field Labs was a friendly and awesome bunch. Keep an eye on these guys! After the presentations, we worked on our demos for the remainder of the day until it was time to present. On the first day, I ported my upcoming VR experience, PolyFish, to the Project Tango to experiment with motion control. It was amazing being able to walk around a physical environment and have it correspond to the virtual environment. On Day 2 I focused on expanding the practical side of Tango's sensors. After a few close calls running into obstacles, I hacked together an in-game warning icon that uses the Tango's depth sensor. Working with the depth sensor requires working with point clouds, I've never done that before, but it was fairly straightforward using the Tango API to measure distances. Using the point cloud to get this simple data felt like overkill, but when it worked, it worked well. I almost wished there was a simple laser measuring device on the Tango (like you can get at a home improvement store) to make collisions a little more straightforward. Once the PolyFish demo was in a good spot, I moved on to mother other passion: Faceted Flight. For the Faceted Flight demo, I wanted to use the Tango as both a level creation tool and a the controller for the game. In the Faceted Flight: Tango experience, players would look through the tablet and see an empty landscape and a transparent floating ring in front of them. When players tap the screen, a ring was placed in the level. Players were able to walk around the conference room, which was akin to walking around the environment. As they walked around they could build the level by placing rings. Once the player is ready, they can then "fly" through the level, but walking around the conf room and steering the ship through the rings. It was rough as hell, but showed a good amount of potential for fun times. At the end of Day 2 we presented our demos to the group. The teams ranged from single people to 6 person teams, and the content shown was great. The winners of the demo day were Loot Crate and SphereOS. Awesome teams, all around. My VR Story: answers to a 7th Grader's questions about VR. I recently answered a 7th grader's questions about Virtual Reality. Answering these questions is the first time I've really thought about a lot of these things since I dove head-first into VR development a couple of years ago. What do you think? Would you have answered differently? Sound off in the comments! What makes you interested in virtual reality? I love the sense of experience you get from VR. The next best thing to doing something in RL is doing it in VR. It has a much more profound impact than watching a video or even playing a game on a single screen. Do you think that in the coming years the idea of virtual reality will be more wide spread than it is now? Yes, completely. The market for VR is growing incredibly fast. On the hardware side, you have some incredibly amazing companies building awesome tech. Last year around this time, the best headset available was a somewhat crappy (i loved it) dev kit, the Oculus Rift DK1. This year we have a pretty great consumer headset on the market w/ Gear VR. Im pretty sure we're going to see some amazing new tech at GDC in a couple of weeks too. What are some obstacles, in your opinion, that virtual reality has to overcome? The largest obstacle is motion sickness. It's incredibly easy to make a VR experience that can make people sick. Many developers are struggling to make non-sickness inducing VR apps. The next barrier is breaking down the walls built up by VR's false start in the 90s. When you mention VR, people look at you like you're crazy. Once they try it however, they want to experience more. What features do you think are essential to good virtual reality? Number one is keeping a consistently high frame-rate. Skipped frames, judder, hiccups, all the crap that is merely annoying in mono-vision games are vomit-inducing in Virtual Reality. Attention to User-Experience is also essential for a great Virtual Reality. Donning a Headset is as disorienting as putting a blindfold on. If your player can't figure out what to do, they get even more disoriented, uncomfortable, and unlikely to continue playing. What aspects of virtual reality should make people excited? I think the experiential aspect of VR is overlooked by many. It's an incredibly tough sell until you actually try it for yourself. Education will be revolutionized by VR. Whether it's virtual field trips to ANY place in the world at ANY point in time or exploring the insides of our bodies from the view of a nanomachine. At this point, we're only limited by our imaginations. How did you first find out about virtual reality? My first experience with VR was at Epcot Center when I was about 12 or 13. They had a Disney Imagineering demo set up where they chose people from the audience to race against each other in an Aladdin Magic Carpet. They had these crazy sci-fi looking headsets and sat on a platform that moved as you steered the magic carpet. I was sold. They took the Aladdin VR experience to Disney Quest some years later but without the motion platforms. Here's a video of what it looked like when I did it. What is the best experience you've had with the technology? By far my best experience was in the Valve Room last March. The next best experience was with Crescent Bay at Oculus Connect last Sept. The largest difference between the two was that I was free to roam around a room the size of a bedroom with the Valve Headset. The Crescent Bay experience was great but I was limited to an area of about 4 sq feet. What would you like to see in future iterations of head mounted displays, if any? I'd love to see full positional tracking on all headsets. If you could optically track my hands too, that'd be rad. Do you have an opinion on inputs for virtual reality? Have any of the kickstarter projects appealed to you? The Sixense and Nimble projects look awesome. I've tried Leap Motion, but my experience with their tracking has been poor. They just released an update, so it's something to play with more. In general, are there any peripherals you are interested in when it comes to head mounted displays? I'm excited to see which input devices take off. I'm a big fan of wireless peripherals. Wireless controllers, headphones, that sort of thing. It makes the experience that much more approachable. Otherwise with all the cables, getting ready for a VR session is like suiting up to go SCUBA diving. Do you have any ideas for types of experiences that could be made in virtual reality, that have not yet been created? What device did you use for your first virtual reality experience? Here's a paper about the headset Disney was using in the 90s. In one hundred years, do you think people are going to look back and think that virtual reality was a very important innovation for humanity? Absolutely. I think they'll also look back and laugh at all those people with funny looking things on their faces. What is your opinion on the competitors of Oculus? The more the merrier. When one company gains too much of a monopoly, Quality and Diversity suffer. Look at the lack of creativity in the mainstream film and games industry. History repeats itself unless people take an active roll preventing it. Do you believe that competitors drive innovation? As VR content creators, we have the ability to physically affect how our players feel. It's incredibly easy to accidentally make our players sick and it's such a crappy feeling when it happens. Rule number 1 for VR devs needs to be: Don't make people sick. The other unexpected thing has been the over-the-top reaction from players to when they play it. Live demos of my VR games have been sooo much more powerful than games I've demoed in the past. Responses went from "Yeah, that's fun!" to "OMG, that's better than going to Six Flags!" See ya next time when I post my impressions of Day 2 of the Project Tango Game Developer Event! Project Tango Game Developer Event, Day 1. A few weeks ago I was lucky enough to score an invitation to a Project Tango Game Developer Event at the Googleplex in Mountain View. The event was held last week and was tons of fun, so I thought I'd share my experience. The event kicked off with Johnny Lee giving the audience a background on Project Tango's key features: Motion Tracking, Area Learning, and Depth Sensing. Motion Tracking focuses on the devices position and orientation in space. Instead of just using a gyroscope for tilt, Project Tango harnesses a crazy amount of computer vision technology to deliver the next level of interactivity. Players will now be able to walk through a game scene not by hitting a button, but by walking themselves. As of now, the motion tracking on Project Tango doesn't seem as precise as Valve's solution or Oculus's Crescent Bay (sub milimeter?). It makes up for the lack of precision by delivering a completely un-tethered experience. Motion Tracking alone can cause drift, which the Project Tango team has solved with Area Learning. Area Learning takes notice of features in an environment and uses those notes as reference points to help correct for Drift. While moving about the environment, Project Tango can record an Area Definition File (ADF). Where Area Learning really shines is using these ADF's to recognize a space and "remember" if you've been there before. Say you launch a Project Tango app in your living room. Assuming you've played in your living room before, then Tango will recognize feature, notice that you're in the living room, and use that data to calculate exactly what your position should be according to its ADF. Stinkdigital was on-hand to talk about their experience creating Bullseye's Playground, a Project Tango app for use in 4 Target(brand) stores. They combined ADF data from store interiors with a virtual winter environment to create a mashup of physical and virtual worlds. Looking through their own eyes, players saw just your average looking store aisles. Through the lens of Project Tango, their Target Store was transformed into a wintery wonder land waiting to be explored. It looked like an awesome experience. The final of Project Tango's key features we discussed was Depth sensing. A Depth sensing camera can be used to create a point cloud of the environment immediately in front of the Tango device. In the Visual Effects industry, point clouds are commonly used to create photo-realistic computer generated models. While Project Tango can create models from point cloud data, it is very slow doing so. (lot's of data for a tablet to handle!) By using point cloud data as a measuring device, physical barriers (think walls, pillars, chairs, people) can be accounted for in a virtual environment. Next time I'll talk about Day 2 of the event, Faceted Flight on Project Tango, and the Demo winners. Do you like content like this? Sound off in the comments! Hey folks! I was modeling arches to test out in Faceted Flight and thought I'd record a timelapse. What do you think? Want to see more of this sort of thing? 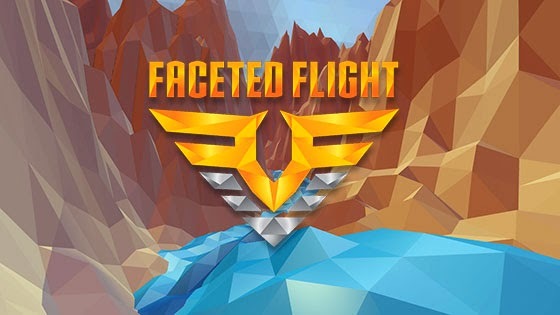 Vote for Faceted Flight on Greenlight! Hey everyone! Long time no talk. I've been insanely busy in VR-land, and its been awesome times. The project furthest along is Faceted Flight and we're now up on Greenlight! Please go give us a Vote! Epic Weekend for Faceted Flight! Holy crap! Faceted Flight had a pretty huge weekend. For starters, Tom over at TheRiftArcade posted his hands-on impressions of Faceted Flight. "Part flight-sim, part racer, Faceted Flight has blasted out of nowhere onto the VR landscape." "...it’s fun to play, there’s no disorientation even when the ship is twirling around canyon corners and there’s just something about the feel of the game that gives it an edge over other flying games on the Rift..."
And if that wasn't enough: FF was on Cymatic Bruce's Sunday Stream yesterday. Not only were we lucky that Bruce played, but he freestyled to the title music. After many different forms, this is the newest mutation of my Virtual Reality experiments. You guys have seen it as "Faceted" for a while now. I've decided to dub it something more fitting: Faceted Flight. 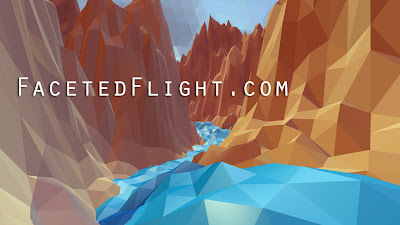 With Faceted Flight, I want players to experience the exhilaration of flying through a variety of beautiful environments. Faceted flight now has a fancy new website, check it out after you watch the video! © 2014 mattscottgames.com. All rights reserved.. Awesome Inc. theme. Powered by Blogger.